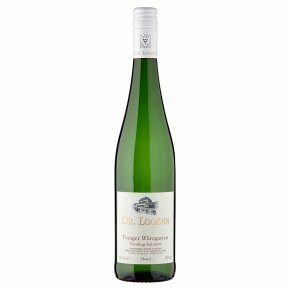 With an awards cabinet full of medals, this regal Riesling is an absolute treat. Naturally low in alcohol it is an ideal companion to mildly spicy stir fry dishes, a wide variety of Asian cuisine or simply serve it as a welcome drink and keep your guests guessing as to what delicacy they’re enjoying. There is a kiss of sweetness, but rest assured this is not a “sweet” wine and it is balanced beautifully by the fresh minerality of the wine, courtesy of steep, hillside vines and stoney soils. Wine of Germany. 91 points 2011 vintage, Wine Spectator. Silver Medal 2011 vintage, International Wine & Spirit Competition. Gold Medal 2009 vintage, International Wine Challenge. The blazing red volcanic soil of the Würzgarten ("Spice Garden") vineyard make it unique. It's an insanely steep site whose wines burst with spicy aromas, exotic fruit flavors and a mesmerizing earthiness. It is naturally light in alcohol and is an ideal companion to mildly spicy stir fry dishes, a wide variety of Asian cuisine or simply serve it as a welcome drink.